Herbert Randolph “Randy” Swainson, 50, of Belgrade, Montana. Fifty-one years ago, Randy made the front page of the Livingston Enterprise when he made his way into this world on February 29th, 1968. His spirit now soars over Paradise Valley and the beautiful big skies of Montana. Randy left us on Saturday, January 26th, 2019 at his home in Belgrade, surrounded by family who love him. When someone departs this world, we weep, we laugh, we share stories, we remember the amazing person whom we will miss forever. Randy’s legacy is that he cared, and he was kind. He loved his family and his friends deeply. He lived life loud and full. 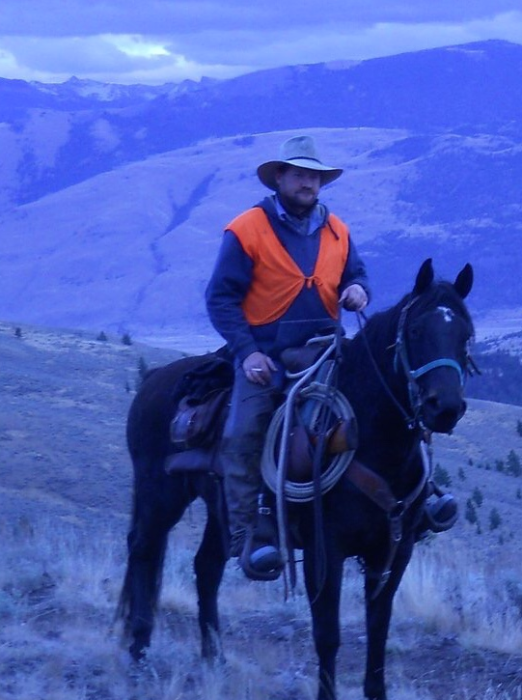 Many times, you could find Randy on horseback, elk hunting, riding snow machines, flying airplanes or hosting a BBQ. Professionally, his reputation and skill as a heavy equipment operator always kept him in high demand. As a friend recently remarked, “Randy could dig a basement with his eyes closed!” One of his successes was starting RS Express Trucking Company located in Belgrade. His shop was the scene for camaraderie and countless hours of wrenching on some piece of equipment. Randy’s memory lives on in his children, Tristan and Taylor Swainson and their mother, Anne Swainson; his mother, Allene Swainson of Belgrade and father, Bert Swainson of Emigrant and his sisters, Wanda Drudis-Swainson (Carol) and Lara Marlene Swainson (Phil Gaglia). He loved his nieces, Madison (Gaglia) Williamson, Savannah Gaglia, Annalyn Drudis-Swainson and nephews: Dante Gaglia and Aidan Drudis-Swainson. He will also be remembered by his aunt, Donna Clark and her family Sherry, Butch (Tammy), Leslie (Jock), Chris, Jesse, Jody, Jenna, Jessie, Lynsey, Amanda and Sawyer and uncle, Dave Ogan (Peggy) and his family Michael, Brian, Rick, Wes, Travis, Megan and Cordell. A celebration of his life will be held in Paradise Valley, details will be posted when they are finalized. Randy was simply the best! The best son, dad, brother and friend. The family wishes to thank the Bozeman Cancer Center and Hospice for their care.